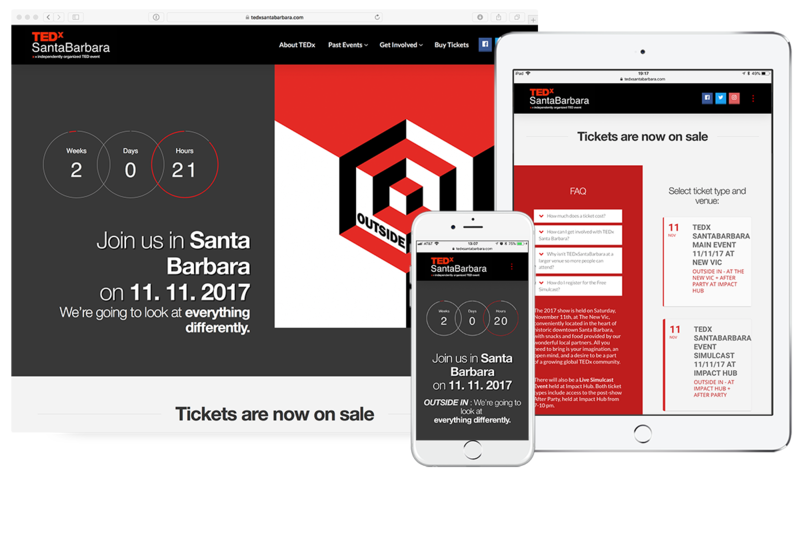 TEDxSantaBarbara, a volunteer effort supported by local partners, allows us to produce an event that exemplifies the premium brand Santa Barbara represents. Our 2016 event featured 21 speakers in front of a sold-out crowd, and embodied TED’s mission to highlight Ideas Worth Spreading. Incidentally, PXLPod Media’s Christopher Michael has acted as CTO of TEDxSantaBarbara for the 4 years it has run. WordPress website geared to lead generation and paid event registration. Custom MailChimp Automation sequences to deliver welcome packages to workshop attendees. Stripe integration for easy payments. OMG that’s one LONG Homepage! Event registration and payment capture for attendees. Lead capture for interested prospects with a MailChimp automation system to sell them into the event. Showcase for each speaker to tease their upcoming TEDx Talk. Showcase for Sponsors and Volunteers. Application system needed to be built for the purpose of screening potential speakers. This application system had to allow for the upload of documents and video files in a way that remained organized so that volunteers could review and curate. Speaker pages needed to be updated after the show to include the embedded YouTube video of their TEDx Talk with social share. Pre-Show lead capture had to be changed over to a new sequence to capture leads for next year’s show. Volunteer intake forms needed to be updated. We built the event registration process using Gravity Forms to handle the logistics and front-end display duties, and we plugged Stripe into the back end as a merchant gateway. Stripe collects the money from the buyer and deposits it into the client bank account. Meanwhile, Gravity Forms is also integrated with MailChimp so that each event registrant is subscribed to a customer list there which triggers an automated MailChimp Workflow causing a welcome packet to be emailed out immediately while placing the customer into a newsletter queue. We’re big fans of Gravity Forms, and I’ve written a bit about the benefits of using Gravity Forms here on the blog. In the case of TEDxSantaBarbara, using Gravity Forms was an especially appropriate choice as it creates a wonderfully well-organized library of entries that you can access later or export to a .CSV file later. Gravity Forms will also forward all of that entry-data into almost any CMS system, though we didn’t go there on this project. Hosting: TEDxSantaBarbara.com is hosted on WPEngine Manage WordPress Hosting, which we feel is just about the best thing out there right now for secure and reliable WordPress hosting. PXLPod Web Strategy’s Christopher Michael (yeah, that’s me. Hi. I write all of the copy here on the site..) is currently CTO of TEDxSantaBarbara.com. He (I) built this site over the course of a couple of weekends and maintain it as part of the SecurePod Maintenance Plan that Mark Sylvester and Kymberlee Weil have enrolled in to protect and cover their websites. Christopher has deep technical knowledge in all of the areas we really needed help: inbound marketing, SEO, SEM, effective web design and development, social media strategy and especially, how to manage me, the CEO. Christopher knows my business really well. He has taken the time to learn about my objectives and the outcomes I want from my website. His intimate understanding of my business goals makes him part of my team, in that he can offer suggestions and comment on material that I deliver them when he needs new content. He’ll ask, "Are you sure this is the most effective way to present that new offering?" Which sparks a conversation where the best idea wins, I love that. Reach out! We’re happy to answer any questions you have and get you pointed in the direction that’s right for you. Time to fill out the form! Leave a little bit of information and we'll get this show on the road. WebsiteOnline MarketingSEO / PPC AdsDesign ServicesDevelopmentOtherI'm not entirely sure! This here signup form used to have 9 fields on it. Count 'em, nine. I whittled it down to 4 fields and you know what happened? Fill out the form and I'll tell you. Privacy is our bag, baby. Please note the https: and the green padlock icon up on our URL. That means that anything you type into this here form is secure and won't be intercepted by evil spam bots and sold into digital slavery. Rest assured, we fight the botnet every day of our lives. In the time it's taken you to read this amusing little messages, we could already be calling you back and solving all of your web problems with you!